On December 18, the First International Festival Christmas Lights will be opened. At this point, the whole city will be lighted by garlands, installations and art objects of the festival. 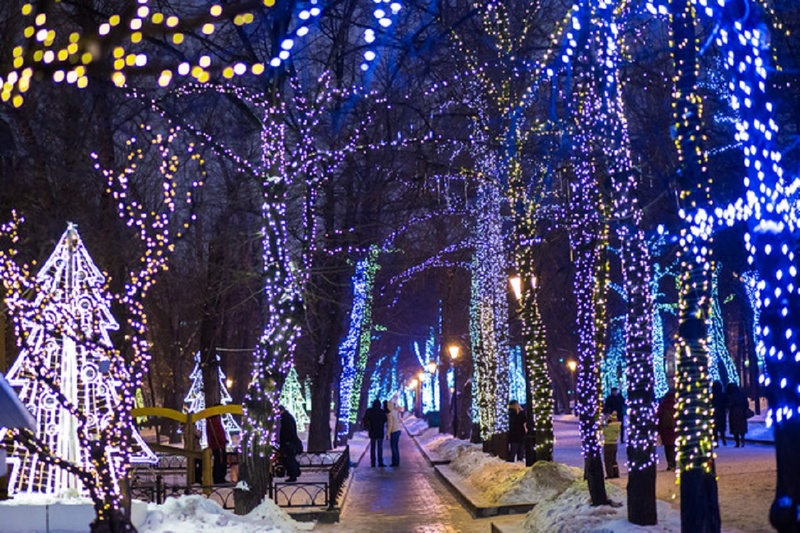 20 pedestrian streets and squares throughout Moscow will get festive lighting! Thus, decorate a huge light installation in the form of numbers 2016 will appear in the city within the festival. You will find shining art objects in Novopushkinsky park, and Semyonovskaya on Tverskaya squares, Revolution Square and in Zelenograd, in Tverskoy, Tsvetnoy and Strastnoy boulevards, as well as Khachaturiana street. A huge lotus will blossom right in the center of Moscow, in the Kamergersky. 7-meter height and more than 8-meter length light installation in the form of a lotus flower will decorate the lane together with chandeliers – decorative elements creating a divergent effect of water circles. Besides, in anticipation of the holidays, the Muzeon Arts Park and the Moscow International Festival Circle of Light will present light objects made from ice within the festival Journey to Christmas. Since December 20, the Crimean embankment will be decorated with lighted ice sculptures and ice slide with dynamic cornering lights. One of the sides of a six-meter slide will be occupied by an ice carved map of Russia in all its geographical diversity. 11 time zones will be light by integrated beneath the ice colored lights from east to west, symbolizing the coming of the New Year across the country – from Vladivostok to Kaliningrad. The Festival Christmas Lights will last until January 10. the light objects will work every day from 17:00 until dawn.